It’s got pockets for a boarding pass, keys, a camera, phone, pens, and sunglasses, and it rolls-up into a neck rest. Welcome to travel Nirvana. This is the ultimate jacket for travel – period. By combining a lightweight PrimaLoft down insulation with a smart design that includes no less than nine custom-made pockets for travel essentials, ExOfficio has once agin proved that it’s got the very best designers of travel gear. The proof? It rolls-up into a neck rest. Oh, and there’s a discrete print on the inside of a world map outline. Seriously, no traveller could ask for more from a jacket. 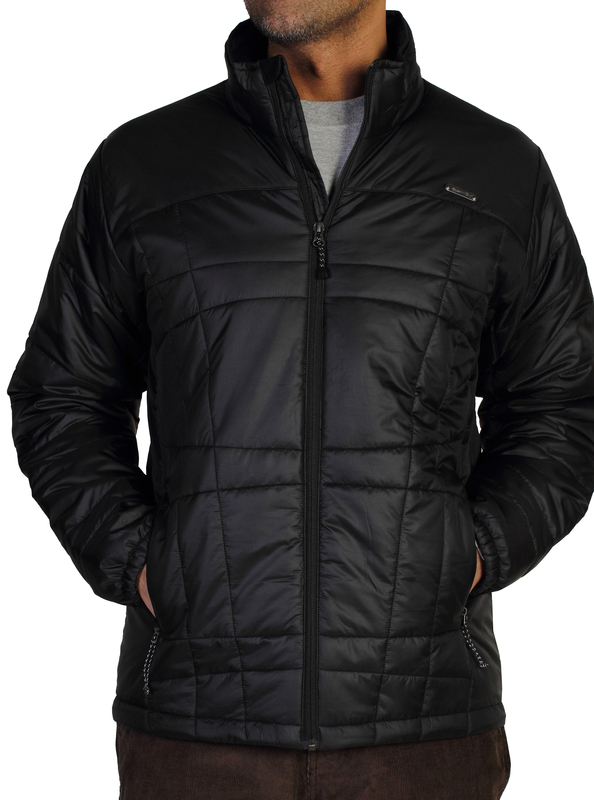 Down jackets are great – comfy and warm – but they’re usually too darn heavy and bulky for travelling. Not the ExOfficio Storm Logic, which weighs just over half a kilo. Smart and great for all seasons, it’s warm without over-doing it, and covers all the bases; those with more ambitious outdoor plans could easily add a layer underneath it. Water resistant and warm, the ExOfficio Storm Logic is an instant travel classic for more reasons than its versatility and lightweight design. Think pockets. On the outside are two zipped pockets, each with soft fleece inside – nice touch. On the inside-left of the main zipper are three pockets; ‘journal’ for a pen, ‘connect’ for a smartphone (complete with a see-through, touch-through transparent screen that, in our test, easily took an iPhone 5S) and ‘getaway’, a long zipped pocket for a boarding pass. There’s one more touch of genius up here; just above the ‘connect’ pocket is a tiny loop of fabric beside the zip for taking the arm of some sunglasses. It’s also useful for attaching earphones that have a clip on the cable. On the right-hand side, it’s even more impressive. At the top is a second pen slot above a soft-lined ‘protect’ pocket for sunglasses, with the lower portion containing a ‘capture’ section for a compact camera, a transparent ‘locate’ pocket for a business card, and a zipped ‘secure’ area for keys – complete with a keyring attached to the inside. Is there any point in writing more about the ExOfficio Storm Logic? You’re buying it, right? The ExOfficio Storm Logic has one more trick up its sleeve. Inside the jacket’s back, about six inches up from the bottom, is a ‘snooze’ pocket. While it could easily be used for storing documents or even for taking a scarf or hat while out walking, it’s there for the Storm Logic’s self-storage. It rolls-up into that pocket to form a sausage shape that’s 59x13cm, and ideal for using as a neck rest on a place or bus. It’s even got Velcro tabs at each end to curl it around to form a crescent. Away from its myriad travel-friendly design concepts is more proof – if any was needed – that ExOfficio’s designers are frequent travellers. The collar is backed with soft fleece and there’s a soft chin-guard, too, so it’s comfy when zipped-up to the top, there’s a flap of fabric behind the zip to prevent the wind getting into that particular weak-point, and there’s a drawstring around the bottom and elastic on the cuffs, again to maximise the warmth that Storm Logic can keep inside it. Is this the finest jacket ever made for travellers? It’s impossible not to think that, with the snug wear, lightweight design and just the finest thought-out array of pockets we’ve ever seen just so impressive. Buy it, love it, roll it up and sleep on it.